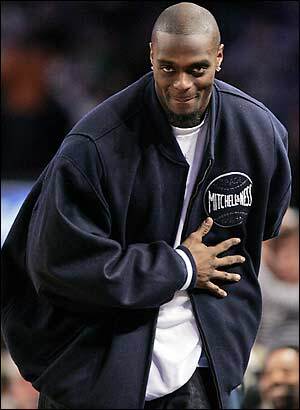 Take a bow Plaxico, only you my friend only you! In what has been a reported “accidental shooting,” Giants receiver Plaxico Burress took a bullet to the leg late Friday evening at a night club. According to ESPN news, Plaxico actually shot himself in his right thigh near the popular two story “Latin Quarter Nightclub” in East Side Manhattan. The injury is said to not be life threatening, as he had been released from hospital care early this saturday at 2:00 p.m. With an outstanding five year contract of some $35 million, what is to come of this self-inflicted injury? In just four and a half seasons, DeAngelo Hall is already on his third NFL team. The Washington Redskins agreed to a one year deal worth just over $800,000 with cornerback DeAngelo Hall on Friday November 7th, who had just been waived by the Oakland Raiders. It didn’t take too long for the Pro Bowler to find himself a new home. Although there has been a consensus that Hall has been underachieving this past half-season in Oakland, and the previous year in Atlanta, when looked at closely, it is easy to see why Hall can be a good fit for the Redskins. First of all, Washington has been suffering from injuries in the secondary, and namely at cornerback; starter Shawn Springs, nickel back Fred Smoot, and backup Leigh Torrence. And although none of the three has been injured for extended periods of time, they have all been injured frequently and sporadically enough that the Redskins could not pass up this opportunity. Aside from the injury bug in Washington, there is also the stable of wide receivers the Redskins have to face twice each year within their division. The New York Giants sport big game and big height, six foot five inch, Plaxico Burress. We all know about Dallas and Terrell Owens, but now with the pickup of big game, and six foot three, Roy Williams, the necessity for a player of Hall’s talents is ever more of the essence. Finally, the Eagles have a budding star in rookie DeSean Jackson, whose 34 receptions for 525 yards have him on pace to reach 1,050 total, and a quarterback in Donovan McNabb who has shown a propensity to do more with less over his career. As long as DeAngelo Hall can resume the level play during his Pro Bowl garnering seasons, then the Redskins will have made a good choice. If not, they don’t lose much as they only signed him for the remainder of this season. Santonio Holmes has recently been suspended for Marijuana possession when he was pulled over by a police officer. But I say he is not guilty and shouldn’t be suspended here is why. 1. It is clear the officer was a Giants fan and he planted the drugs to take him out of this weeks game. 3. Ray Lewis said that if he didn’t get high with him he would put a bounty on him too. 4. The weed that they confiscated was dirt weed Santonio only smokes stickiest of the icky. 5. Ricky Williams was not the passenger in the car so their couldn’t have been any weed. as in Mel Blount the Steelers Hall of Fame Corner Back. 7. He fell prey to an e-mail scam disguised as a letter from Roger Goodell saying weed no longer is against NFL rules. 8. He didn’t realize that he was driving Bam Morris’ car. 10. If he doesn’t have the hand eye coordination to catch a ball how can he roll a blunt? Can Underachieving NFL Favorites Keep Pace with the Rest of the League? Before the start of the 2008 NFL season there were four sure-fire Super Bowl favorites; the Dallas Cowboys, San Diego Chargers, Indianapolis Colts and New England Patriots. So far after seven weeks only the Patriots seem to have any type of competitive balance with a 4-2 record and only one game behind AFC East leading Buffalo Bills at 5-1. The aforementioned teams have not faired so well and are a combined 10-10. Even though Tony Romo is out, there is no excuse for the lack of effort the Cowboys showed in their 34-14 blowout in St. Louis. They have allowed two upstart teams, the Redskins and Cardinals, and a bottom-feeder in St. Louis get wins against them. Even though Romo was in against the two upstarts, he has averaged at least one turnover per game. The Chargers have been the epitomy of inconsistency through seven games going loss, loss, win, win, loss, win, loss en-route to a 3-4 record. Traveling east has not helped them as they go forward three time zones every time. Now they have to go eight time zones to play the Saints in London this weekend! The Colts are lucky they aren’t 1-5 instead of 3-3. Aside from blowing out the Baltimore Ravens 31-3 in week six, they had to overcome a 15-0 hole in Minnesota, and needed 21 points in the last four minutes of week five to beat the Texans. Unlike the Patriots, the Cowboys are two games behind NFC East leading Giants at 5-1, the Chargers are essentially two games behind the AFC West leading Broncos (since the Broncos beat them), and the Colts are already three games behind the AFC South leading Titans. Now I ask… Do these three teams really sound like Championship Contenders? What is the identity of the New York Jets? Answer: They have no identity. 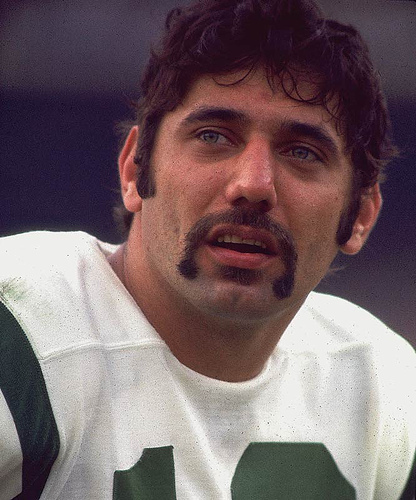 Not Joe Namath, not the sack exchange and not Fireman Ed. Not even the great Brett Favre is not going to fix nor change that. The Tuna couldn’t fix it and even Belichick saw the writing on the wall and bolted for New England. There is no long succession of great QB’s. There is no history of a strong run/pass oriented offensive/defensive juggernaut. It is just not there. The sack exchange? They have long since been forgotten. No one has stepped up to carry on that tradition. The front office has had one bad draft after another and continues to try pull the wool over the fans eyes with big NO NAME head coaches. They even tried to fool everyone into thinking that they were serious about moving back to NY. Them sharing a stadium with the Giants further entrenches them as the “second team” in this city. When Donald Trump has lunch with Bill Gates do they share a salad? NO! 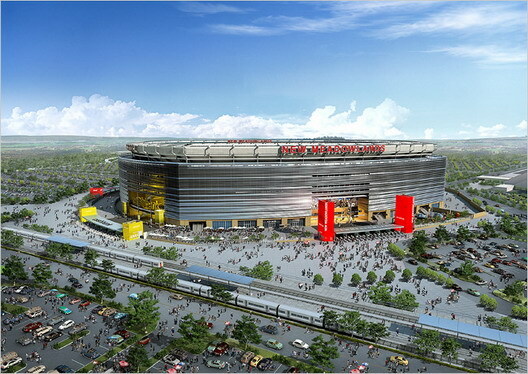 So why should the Jets be sharing a stadium with the Giants that is no where close to their fan base? It gets harder and harder to even want to root for them anymore. If you are lucky enough to get tickets you still have to drive out to that hole in the swamp they call home. They need a major change. New ownership would be great. A new home IN NEW YORK would be even better. Perhaps they could find some empty space in the Bronx? I said it from day one, that Justin Tuck has more ability then the media wanted to give him credit for. Gee whiz, look at all the ESPN columnists and SportsCenter announcers now say they all love “Justin Tuck” and portraying him as the next coming of Christ for the New York Defensive line. 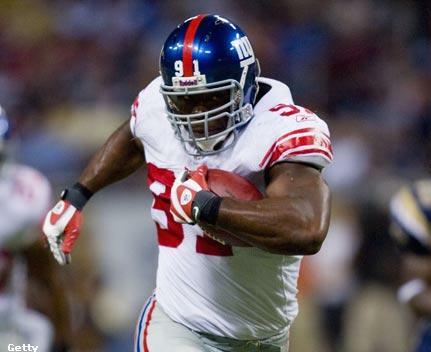 They said without Strahan and Osi that the Giants Justin Tuck could not fill “hole in the Giants Defense” and therefore defensively the Gmen would struggle. This is like political nonsense almost. When you are wrong you are wrong, the Giants D is looking pretty solid. I even saw some Cowboy fan say on a blog that “Tuck is no strahan, and without Osi they probobly will loose all but two games this year”. Wow! I thought to myself, “what an idiot”. Regardless, I know when to say, “Hey I was right” and “You were wrong”. I would just like to also mention when a DE intercepts a pass and runs it back for a TD, that player is something special. The Big Blue D will have bad games this year, so please don’t think they are flawless.They, however, will be one of the top 8 units in the NFL, I promise. So if you need a DST or Defense for your fantasy team try to get JUSTIN TUCK and his Big Blue Crew, cause they will be a top team in Sacks and Interceptions this year regardless of their tough schedule. Be on the watch for LB Gerris Wilkinson he has alot of potential and will definitely look great this year. 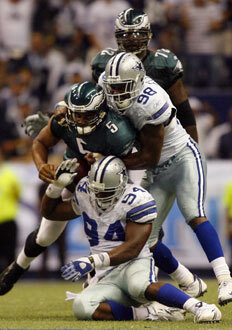 Well In a shootout the dazzled and bewildered all that watched the Cowboys beat the Eagles. These were high powered offenses that torched their opposing defenses all game save for the mistakes. like both did last night other teams take note. If I am going against the Cowboys I know that if my Quarterback can scramble people will be open, and if it’s the eagles I know a little speed and time will make them eat their own blitzes. So what does this mean it means that each team is going to have a very tough time all year from now on. Which means that things are going to turn out how I thought in the NFC East, with Eagles winning the division Cowboys second and Giants coming in third. Defense Wins Championships or Great Quarterbacking? One of the longest standing arguments in today’s NFL has been the viewpoint that it takes a strong defense to become a champion. Over the past few years teams like the Baltimore Ravens, Tampa Bay Buccaneers and Pittsburgh Steelers have been able to remain in at least competitive contention, if not championship contention, due to their outstandingly consistent play on defense. However, in this writer’s eyes, the most important factor in helping a team turn the corner from respectability to prominence has been the position of quarterback. Over the past ten years alone, almost every Super Bowl champion has been led by a pro-bowl caliber, if not perennial pro-bowl quarterback. In most cases a good defense played a key role in each winner’s success, but on most of those teams, there was strong quarterback play involved as well. During the 1998 season the Denver Broncos won the title with John Elway, and everyone knows how great he was. 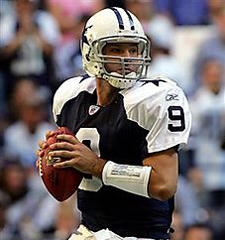 In 1999, the St. Louis Rams became league champions behind the light-out play of MVP quarterback Kurt Warner. Everybody will remember the Greatest Show on Turf as one of those teams that had such a great offense, they could overcome sub par-to-average defense to win games. In 2000, the Baltimore Ravens would make a name in history as one of those teams that could overcome average, but not great, offensive play with a tenacious defense that created turnovers and stymied opponents week in and week out with its defense. Let’s use a paragraph too look a little deeper at those 2000 Ravens. That team’s defense was so good that it held three regular season opponents to seven points, their Super Bowl opponent to seven points (the New York Giants), one regular season opponent to three points, and three post-season opponents to three points (the Wild Card Denver Broncos and the AFC Championship host Oakland Raiders), and four regular season opponents to zero points. How often does a defense that strong come along? Not too often I would say. I gahter that that the 2000 Ravens and the 1985 Bears were two teams in NFL history that literally succeeded almost an entire season based solely on excellent defense. In 2001, Tom Brady came along and got his first Super Bowl title when he drove his team downfield to kick a game-winning field goal. In 2002, another team with a great defense raised the Lombardi Trophy and this time it was the Tampa Bay Buccaneers. However, Brad Johnson was Tampa’s quarterback that year and in 13 regular season games, finished the season with 22 touchdown passes against six interceptions, a 62.3% completion percentage, and a 92.9 Quarterback rating (the best of his career). The next two years would conclude with Tom Brady’s Patriots coming out on top, where-in 2003 Tom Brady led yet another drive downfield for a game-winning field goal, and in 2004 it was Brady and the Patriots who got the trophy. In 2005 the surprise Pittsburgh Steelers came out on top. 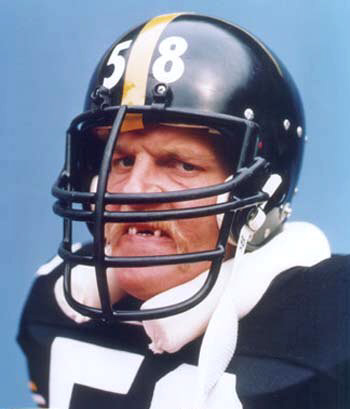 Even though it was the defense that showed up in the Super Bowl and not Ben Roethlisberger, it was Big Ben’s dazzling play in Cincinnati in the Wild Card round (14-19 passing for 74%, 208 yards, and 3 TDs), in Indianapolis in the Divisional Round (14-24 passing, 197 yards, and 2 TDs with one INT), and in Denver in the AFC Championship Game (21-29 passing, 275 yards, 2 passing TDs, and one rushing TD) that got them there. In this case it was strong defense and strong quarterback play that produced a champion. In 2006 Peyton Manning and the strong play of the Colts’ defense won the title. Finally, last year, even though the Giants had a great pass-rushing defense while leading the league in sacks, nobody would have picked New York to come out on top if it hadn’t been for Eli Manning’s highly unexpected pro-bowl level of play throughout the post-season, including the Super Bowl. I want everybody to take a long step back when they think that defense wins championships, because in all reality it takes a solid defense coupled by strong quarterback play to win a Super Bowl, with a few exceptions every now and then on both sides of the ball. So remember, a great defense will bring you respectability, but it takes a great quarterback to take a team to prominence!